We are pleased to announce the availability of new payment options available for all our customers. Starting from today, customers will have the ability to make invoice payments using their Visa or MasterCard directly, rather than indirectly via a PayPal account. For the provision of this service we have partnered with PayDollar by AsiaPay Limited, Hong Kong’s largest online payment provider. Customers will notice a slight change in the invoice payment process, whereby they will be redirected to the PayDollar Payment Service to enter their card details. This process ensures that, in the unlikely event of our billing system being compromised, there is no chance that your card details could be lost, since we don’t ever store credit card details in our database. This new service also supports the Verified By Visa and Mastercard SecureCode third-domain security verification process, for cards that support it. With this system each transaction must be approved by your bank directly, thereby eliminating the possibility of your card details being used without your personal verification. The other benefit of this change is that we will now have significantly improved ability to diagnose and assist with any payment problems that may arise. This will be welcome news for any customers who may have suffered inexplicable issues with PayPal transactions in the past. Of course, for customers who still prefer to use PayPal, this option is still available. Just make sure to click the PayPal checkbox on the invoice payment screen. We are excited to announce the deployment and general availability of a brand new version of the ProjectHut Control Panel! Existing customers will be familiar with the old Control Panel, located at the admin/ area of their account. This new console replaces and extends the functionality of the previous interface, and can be accessed at the same URL location. 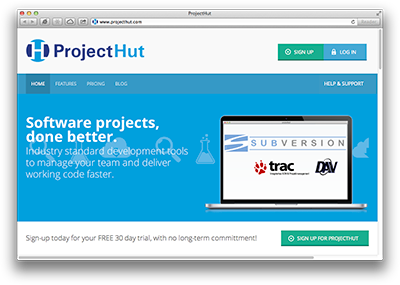 A brand new ‘flat-style’ interface design and layout, styled to match the new ProjectHut website. Updated Account Summary page, with more information and convenient links to most commonly accessed features, such as the daily backup download link. Support for more bulk operations, such as adding a new Subversion permission rule to multiple users/groups in one action. Support for displaying Gravatar images in the profile for the primary account holder. A more intuitive and easy-to-use user-interface, with detailed help and better descriptions of actions for each page. Additional popup help information for detailed functions such as assigning Trac Permissions and post-commit Trac hook integration. Although not as visible, behind the scenes there have also been many other technical improvements to the Control Panel. These include: upgrading the Control Panel app to the latest Rails 4 / Ruby 2 platform, refactoring the app to use a RESTful API URL structure, support for turbolinks and asset pipelining for improved performance, as well as improved test coverage. We have now also fully automated the deployment of the Control Panel application, so we can adopt a more iterative and incremental deployment process in the future. This means we can roll-out new features and fixes more quickly and more often. We encourage all customers to login to their Control Panel area and try out the new interface. Please let us know if you encounter any issues, and also if you have any suggestions on how we might improve the interface further! A Version Control System (VCS), also known as a Revision Control System, is software that manages changes to collections of files and directories. While a VCS is useful for managing changes to many types of files, this software is particularly useful for programmers to save files for the source code of computer programs. A VCS keeps track of all of the changes that occur in each revision of the file, the person who made the changes, and the reason behind the modification. Changes are usually identified by an incrementing number (also known as revision number) or letter code, and reflect the content of the files at a specific point in time. Why is there a need to use a VCS when you can simply save the files in a different filename in one folder? Unlike your usual multiple file saving process, a VCS does not store the full copies of each revision. Instead, it stores only the changes that happen in each revision. That saves a lot of disk space, and also removes the need for the user to manage the naming of the revisions manually. Hence, a VCS is particularly useful for large, fast-changing projects with multiple authors who all need to track and coordinate all changes in each version. Why should different versions of a file be tracked? When the most recent version of the file is modified or corrupted, a VCS makes it easy to go back to the previous revision and start again. Also, programmers use the VCS to compare the different versions of their software. By comparing the different versions, they can determine when bugs were introduced and also when were they fixed. Any problems that may arise from a change may be addressed by reviewing the revision, noting who made the change, and the reason behind the change. Tracking of different versions is also necessary in establishing precedence. Because a VCS keeps track of the person who made changes to the file, it can provide necessary data to solve a dispute regarding ownership of code or ideas. Version control systems are especially useful for collaborative work. Multiple users can edit the files at one time, without affecting each other’s changes. When they have finished working with a file, they can then decide to merge their versions as one. When two users independently change the same part in a file, they are automatically flagged when the files are merged. Hence, they are still responsible for tracking if the final version is correct. What are the different Version Control Systems available? Version Control Systems can be provided using software installed in-house, or can be accessed via an online version control system provider. Online VCS systems also provide additional functionality, such as bug tracking, archiving, and user management. They are often used for projects that do not have the resources yet to maintain their own server for version control, and also for projects that wish to benefit from the ease of use and additional redundancy provided by an online system. Concurrent Versioning System (CVS) used to be the most widely used version control system. However, Subversion and Git have long since overtaken it, and are now the most commonly used systems for open source projects. The basic capabilities of these systems in some ways are quite similar to CVS, but they offer much greater functionality. How does a VCS work? Some version control systems, like CVS and SVN, have centralized repositories. This works by setting up a single repository which acts as the central store of the system. The repository usually stores information in a hierarchy of files and directories. Check-outs and check-ins of files are done with reference to this central repository. Multiple clients can then connect to the repository and commit changes. Normally, they can only see the latest version of the files. However, they can also review the change history and restore previous versions using VCS tools. Alternatively, in a distributed VCS like Git or Mercurial, many repositories may be used and no single repository is authoritative. Files can be checked out and checked into any repository. When a file is checked into a different repository, it is integrated as a merge or patch. The responsibility then falls on the users themselves to determine which repository is authoritative. Ultimately, Version Control Systems have been widely studied and applied in the software engineering community for a long time. These systems are being continually developed and improved to best meet the needs of both small local teams and large distributed teams. A VCS is now considered an essential component of any modern software development process. We have just finished an extensive overhaul of the ProjectHut Knowledgebase. As a result, we have extended the FAQ by adding an additional 30 new articles covering the most Frequently Asked Questions answered by our support team! The FAQ has also now been categorised into sections to make it easier to locate the answer to your questions. Should you have any questions about your ProjectHut account, we recommend trying the ProjectHut FAQ first. If you still don’t find an answer to your question there, then of course please submit a support ticket request via the ProjectHut Member Center. Non-customers are also invited to ask questions by using the Contact Us page on our website. What is a SVN repository? Many readers may have heard of the phrase “SVN repository”, but may be unsure exactly what it is. Maybe you have a bit of an idea, but don’t know where or why you would need to use one. This post explains in straightforward terms what is a SVN repository, and gives you a basic understanding of how it works and when and why you should use one. What does SVN stand for? SVN is a shorthand abbreviation of the name “Subversion”. For those who have not heard of it, Subversion is a powerful open-source version control system that is typically used to manage the collections of files that make up software projects. However, a SVN repository it may actually be used for managing any collection of files that are changed or modified over time. Subversion was initially developed by CollabNet as an alternative to the earlier CVS version control system, which suffered a number of limitations, such as being unable to move or rename files. These days Subversion is actively developed and maintained by the Apache Software Foundation and you can download SVN for most platforms for free. The SVN moniker itself actually comes from the name of the command that is typed when accessing SVN repositories via the command-line of a computer, hence it is common practice to use the terms ‘svn’ and ‘subversion’ interchangeably. In simple terms, a SVN repository (or Subversion repository) is a collection of files and directories, bundled together in a special database that also records a complete history of all the changes that have ever been made to these files. Conceptually, a SVN repository is similar to a folder or directory on your computer that may contain a collection of assorted, but related, files and directories. In fact, a SVN repository is typically used to store all the files and directories that make up a single project, or perhaps even a collection of interrelated projects. However unlike a normal folder on your computer that stores only the most recent copy of a collection of files, a SVN repository also stores the history of those files. How does a SVN repository work? One way to think of a SVN repository is by imagining a series of snapshots, called revisions, that record copies of all the files and directories that make up a project at specific points in time. However instead of storing full copies of each revision of every file (which would very quickly require a huge amount of disk space! ), a SVN repository only records the changes or differences between files at each revision. These differences are known as a changeset. A SVN changeset consists of a description of all the additions, modifications and deletions to files within the project required to go from one revision to the next, along with a human-friendly text description that reports the nature of the changes. The collection of all changesets in a project is what makes up a SVN repository. By drawing on this database of changesets, the Subversion tools are able to recreate exactly any revision of any file in the SVN repository, at any point in time. Not only that, it can do so by using far less disk space than would be required if full copies of each of the file revisions were stored instead! What can I use SVN repositories for? By storing a complete history of every change ever made within a project, it is possible to use a SVN repository to do many things that would be difficult or impossible to do with only copies of the project files alone. For example, a SVN repository can be used to quickly “go back in time” and restore all the files of a project to an earlier point in history. This can be very useful if a bug or fault is detected in a new version of the files and you wish to revert back to a previous version that is known to be stable. A SVN repository can also be used to compare different revisions of a file or collection of files, perhaps to review changes or identify possible causes of a newly detected bug. The revision log also makes it easy to keep track of the reasons why a certain change was made. By having a centralised SVN repository, it is possible for you to have multiple developers working on the same project. Everyone in the team can be assured they are working on the latest version of project files, and also be confident that their changes will not be accidentally corrupted or lost by someone else! Some of the more advanced uses allow for multiple versions of the same files to be maintained within the one SVN repository! For example, it is possible to tag and keep track of specific project milestones, such as product releases, so it is possible to quickly revert back to this known version if someone discovers a problem in the future. Similarly, the branching and merging feature allows a change that fixes a bug in the current version of a file to be easily ported to a previous released version of the file. An additional bonus benefit of storing your project files in a SVN repository is that by doing so you immediately create an implicit backup of your data! So should your working copy accidently get corrupted or destroyed for whatever reason, you can always recover the files from the SVN repository. Furthermore, if you use an online subversion hosting service then you have the additional benefit of protection against physical destruction and loss of your project data due to fire or theft of your working computer. Where can I get a SVN repository? Download the SVN tools and setup a server yourself. This is the traditional way to get started as the server is run on your own machine. However, managing this yourself can become difficult and risk-prone, especially should you wish to start granting other people access to collaborate in your SVN repository. Using a SVN hosting service to serve your SVN repository is often a simpler and faster alternative. In this case, the more complex aspects of securing a server and providing authentication and access control for multiple users has already been done for you. 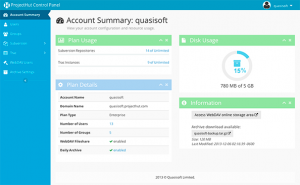 There is also the added benefit of having an automatic off-site backup of all your data, a peace-of-mind that you would otherwise not have by hosting your own server. Whatever solution you choose, once you start using Subversion the power of a SVN repository becomes apparent very quickly. Over time you will discover more and more ways that you can benefit from version control, and eventually you will begin to wonder how you lived without it! What uses have you found for your SVN repository? New ProjectHut Website and Plans Launched! After many months of planning, design and implementation we are proud to unveil the brand new ProjectHut website! Gone is the old fixed-width website that has served us so well for the past six years – the new ProjectHut website has been completely redesigned from scratch to feature the latest in modern, mobile-ready responsive web design. The new layout will adapt dynamically to best fit the size of your browser, making the site easier to read on all mobile devices, tablets and conventional desktop browsers. With the new look comes an improved layout and content to make it easier to understand the features and benefits of using ProjectHut for your projects. The Knowledgebase section has been revised and improved, and a completely new Software and Resources section added that contains instructions on where to find Subversion client software or IDE plugins for your Mac, Windows or Linux based development environment. Existing customers will also notice that the ProjectHut Member Center also has a new look with better integration with the main website. Brand new plans with fantastic value! Coinciding with the launch of the new website, we are also excited to announce a set of brand new ProjectHut Plans! All our plans now offer vastly increased storage quotas at significantly lower prices. For example, our old Developer plan only offered 200MB storage space for $9.95, but the new Developer plan features a massive 1.5GB storage for only a low $9 per month! In addition, we have also added brand new Corporate (15GB) and Enterprise (45GB) plans that offer much greater storage capacities for customers who have outgrown our previous packages. Of course, all our plans continue to offer unlimited users and groups. 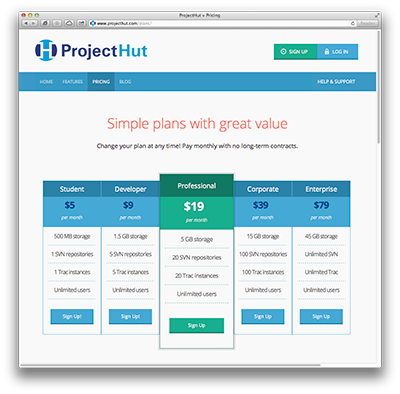 Make sure to check out the new ProjectHut Pricing and Plans page for more details! We are now offering customers who sign-up to ProjectHut for the first time the opportunity to try ProjectHut free of charge! Yes, for the first time ever, we are waiving charges for the first month’s service. You do not even need to enter any payment details when signing up! If you have ever considered trying out our service but been unsure about what to expect, then now is the chance to try the full ProjectHut service completely free of charge! There is no obligation to continue beyond the trial period, so should you decide it is not for you at any time simply let us know and we will close the account. Of course, we do very much hope that you will decide to stay, and if so you will only be required to make a payment starting from the second month of service. So, with nothing to lose and everything to gain, Sign Up Now to start using ProjectHut today! Following an analysis of customer network usage patterns, we have decided to remove the transfer limits that previously applied to all ProjectHut plans. It turns out that these limits were never even close to being reached by any of our customers, and so in order to simplify the ProjectHut service they have been removed entirely. Astute customers will have noticed that the “Monthly data transfer” and “Transfer limit reset” fields have been completely removed from the ProjectHut Control Panel. You can now use the service in a way that best suits your project workflow, without ever worrying about the possibility of encountering any limitations!